A cartoon version of Edward J. Markey will address the conference in Bali. WASHINGTON - Representative Edward J. Markey, a Massachusetts Democrat, will speak about the dangers of global warming to any audience who will hear him. But he couldn't go to one of the biggest stages of all - this week's international conference on climate change in Bali, Indonesia - because of the congressional negotiations over the energy bill in Washington. So a "virtual" Markey, an animated likeness of the congressman called an avatar, will be present instead. Using on online platform called Second Life, Markey will deliver his speech from a computer in Washington tonight and an animated 3-D version of himself will address the conference over a computer screen at the Bali meeting. 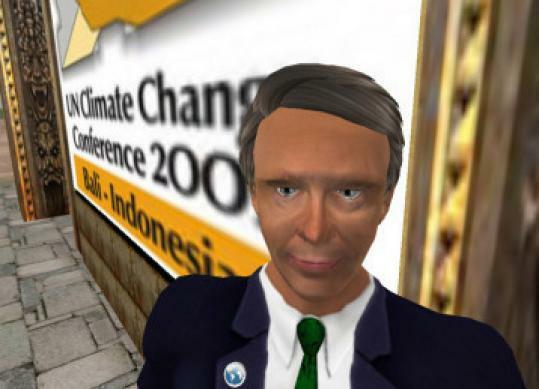 Markey's avatar, dressed in a dark blue suit, white shirt, and green tie, will walk around a computerized version of the Bali conference scene as he speaks. "We've long ago left the world of rotary phones as the exclusive means of communication," Markey told the Globe yesterday. "This makes it possible to create through the virtual world what would be impossible to accomplish in the real world because Bali is one of the remotest locations in the world, and Congress is in session still working on an historic energy bill." A live audience in Bali will hear Markey's speech. In theory, the audience will be able to ask the congressman questions, and Markey will be able to respond instantly over the Internet. Markey said that computer technicians used his picture to create his avatar. While some members of Markey's staff said they thought the congressman's avatar came out well, his computerized image accentuates his high forehead. In some frames, it also appears that his onscreen doppelganger has a fairly extensive combover, but the congressman didn't seem to mind. "I think my tie looks great. They got it right," he said.